The beautiful and pastoral Sea of Galilee with its majestic dates & palm groves, and fed by the Jordan River, is a favorite among Holy Land pilgrims. Jesus settled here in the Jewish fishing town of Capernaum after leaving Nazareth. 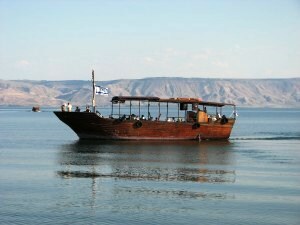 Ahh, yes, the Sea of Galilee… You may have sailed the “Seven Seas”, but if you haven’t sailed on the Sea of Galilee… What can I say- this one’s got SOUL brother! No wonder so many miracles happened in this spot and that it’s a favorite, not only among millions of pilgrims, but with locals too- finding in this place where G-d speaks, peace, tranquility, and inspiration. Actually, in Hebrew, the language of Scripture, the lake is called the “Sea of Kinneret”, which means “Sea of the Harp”. Look at the map on the blog site and you’ll see that it indeed has the shape of a harp, which is a reminder of the Harp of David. Indeed, according to biblical tradition the Messiah will come out of the House of David. No wonder, in the New Testament, Jesus leaves his hometown of Nazareth and comes down to the Sea of Galilee, where he spends the last three years of his life: He settles in the ancient lakeside Jewish town of Capernaum where he centers his public ministry as a roaming rabbi – teacher – miracle-worker. The Sea of Galilee is a actually a freshwater lake, fed by the Jordan River on the northern end. The lake is bigger than most people imagine: 25 km X 15 km (~15 X 7 miles) and 50 meters (~150 feet) deep. It’s part of the Great Rift Valley extending from Turkey to East Africa and is about 200 meters (over 600 feet) below sea level. No wonder it’s so warm, lush, and brimming with tropical and subtropical vegetation: Bananas, Mango, Avocado, Bougainvillea. At the southern end of the Sea of Galilee, where the Jordan River flows out of the lake and winds its way south to the Dead Sea, are beautiful date palm groves, famous since Bible times. The dates were brought to the Holy Temple in Jerusalem as a First Fruits offering and are today exported all over the world. I invite you to join me in discovering the delight of the Sea of Galilee. Together we’ll set set sail aboard one of the wooden boats pictured on this page, cut the motor, and just listen to the silence, the wind, and gentle lapping of the water. Reflecting on the meaning of this very special place, that has little changed since Bible times, you may find yourself breaking out your Bible, singing a hymn, and even kicking up your heels in joy! For more on visiting the Sea of Galilee and the many other fascinating sites in the area contact Zack Shavin, veteran Israel guide and biblical archaeologist at Land of Israel Tours. This entry was posted in Galilee and tagged Capernaum, date palms, Holy Land, Israel, Jesus, Jordan River, nazareth, Sea of Galilee by zshavin. Bookmark the permalink.